Home Actors Shraddha Kapoor and Aditya Roy Kapoor an item in making? Shraddha Kapoor and Aditya Roy Kapoor an item in making? 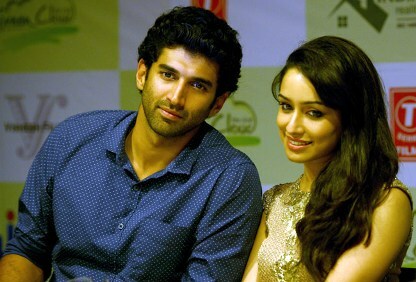 Bollywood actors Shraddha Kapoor and Aditya Kapoor scorched the silver screens with their blockbuster movie ‘Aashiqui 2’. The couple had a great chemistry on screen, but now the recent reports are claiming that the two might even be an item in Bollywood. Even during the shoot of the movie, the actress confessed that she shares a special bond with Aditya, while the actor said that they are ‘slapping buddies’. Their budding relationship might have been proved, as the two stars were recently spotted dancing the night away at a night club in Mumbai and were accompanied by filmmaker Ayan Mukherjee. Onlookers said that the relationship between the two looked special and they were seen getting a bit too intimate. Reports also said that Ayan and Aditya seem to be good friends and were supposed to be in Belgium for the Tomorrowland Film Festival. Aditya could not make it to the event due to other work commitments. Meanwhile, Aditya and Shraddha were the ones who spent most of the night together. Eyewitnesses also said that the two were totally into each other and looked like a couple who is passionately in love. Aditya and Shraddha partied until late in the night. The two are fun-loving actors and are currently focusing on their careers and Aditya was earlier seen as a VJ on TV.